This is the dune at Pierce Stocking Scenic Overlook. The viewing platform, just to the left of the trees at the top, is 450′ above the surface of the water. This is our original guided kayak tour. The aim is the base of the dune at the Pierce Stocking Scenic Overlook. It starts at a parking area in Empire. The total time for the tour is about four hours. Total time on the water approaches three hours. We shuttle you to North Bar Lake where we start the guided kayak tour. We expect to have you in the kayaks and on the water as close to 9:00 am (5:00 pm for evening tours) as possible. The group paddles to the base of the dune at the Pierce Stocking Scenic Overlook. This is just under a mile and a half. 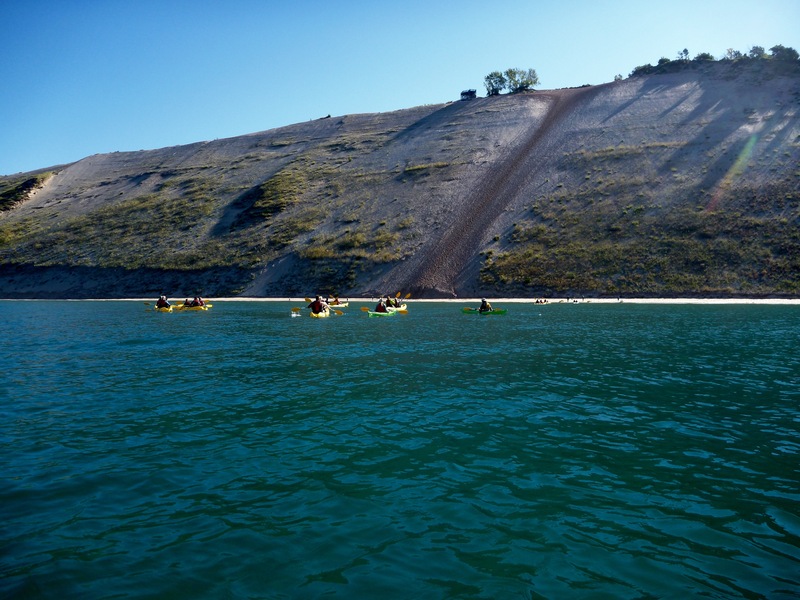 The National Park Service requires that the kayak groups stay in a “pod-like” formation. Everyone is encouraged to climb at least some small portion of the dune (maybe only 10-20 feet of the 450 feet total). 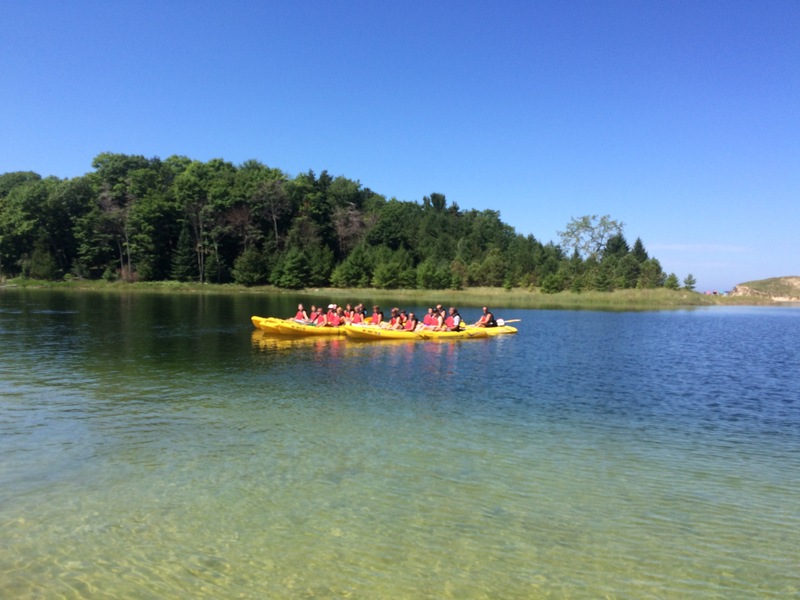 The group members get back in the kayaks and paddle back to North Bar Lake. 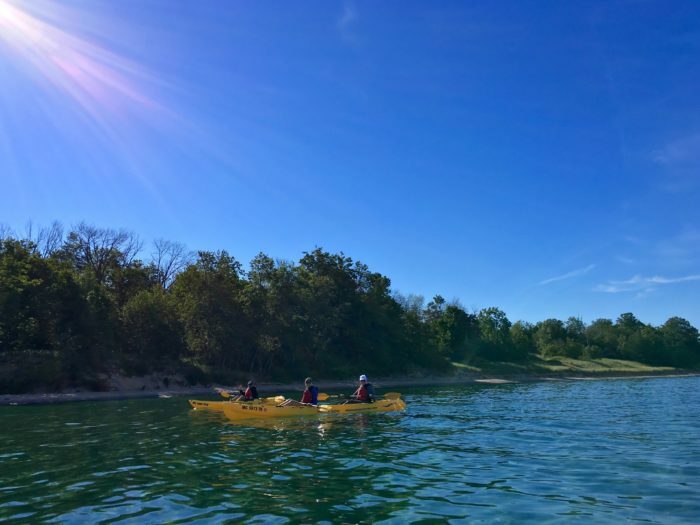 Time permitting, you paddle to the south end of North Bar Lake – we think there is a family of bald eagles with a nest there. We shuttle you back to the parking area at Village Park, Empire. We expect to have you back to your vehicle between 12:30 pm and 1:00 (9:00 pm for evening tours). Please see the Overview item on the drop-down menu for general information about our guided tours. Winding up the trip on North Bar Lake. Be at the Village Park in Empire at 8:20. We expect to return you there between 12:30 and 1:00. Total time on the water will be between two and a half, and three hours. The distance of this trip is just less than three miles. Be at the Village Park in Empire at 4:30. We expect to return you there between 8:30 and 9:00. Please note that this is not described or marketed as a “sunset” type cruise. 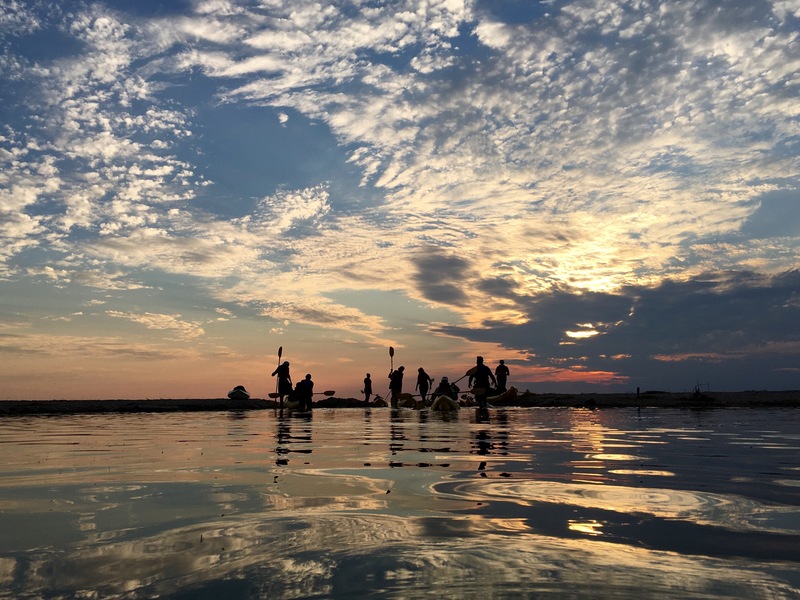 We expect to have you off the water before the sunset. You may be back to your car before sunset and can enjoy it from the public beach in Empire. It is a very popular location for viewing sunsets. An evening trip to the base of Pierce Stocking returning to North Bar Lake.